What different views of marriage are shown in the poetry you have read ? 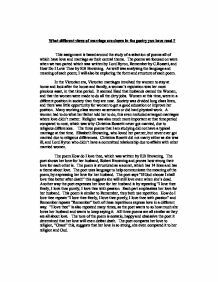 This assignment is based around the study of a selection of poems all of which have love and marriage as their central theme. The poems we focused on were when we two parted which was written by Lord Byron, Remember by C.Rosseti, and How Do I Love Thee by E.B Browning. As well was analysing the language and meaning of each poem; I will also be exploring the form and structure of each poem. In the Victorian era, Victorian marriages involved the women to stay at home and look after the house and family, a woman’s reputation was her most precious asset, in that time period. It seemed liked that husbands owned the Women, and that the women were made to do all the dirty jobs. Women at this time, were in a different position in society than they are now. Society was divided long class lines, and there was little opportunity for women to get a good education or improve her position. Many working class women as servants or did hard physical work. A women had to do what her father told her to do, this even included arranged marriages where love didn’t matter. Religion was also much more important at that time period compared to now, which was why Christina Rossetti never got married, due to religious differences. The three poems that I am studying did not have a typical marriage at that time. Elizabeth Browning, who loved her partner, but never ever got married due to religious differences. Christina Rosetti did not marry either as she was ill, and Lord Byron who didn’t have a committed relationship due to affairs with other married women. The poem How do I love thee, which was written by E.B Browning. The poet shows her love for her husband, Robert Browning and proves how strong their love for each other is. The poem is structured as a sonnet, which has 14 lines and has a theme about love. The poet uses language to help communicate the meaning of the poem, by expressing her love for her husband. The poet says “If God choose I shall love thee better after death” this suggests she will still love even when she’s dead. Another way the poet expresses her love for her husband is by repeating “I love thee freely, I love thee purely, I love thee with passion. Each part emphasizes her love for her husband. This poem is similar to Remember, they both use repetition. How do I love thee repeats “I love thee freely, I love thee purely, I love thee with passion” and Remember repeats “Remember” both of these repetitions express love in a different way. “I love thee” is also repeated many times, as the poet wants to so how much she loves her husband and wants to keep saying it. All three poems are all similar as they are all about love. The tone of the poem is ecstatic, happy and obsessive the poet it determined that her love will even defeat death. The poet compares her love to religion, “Grace” this, suggests that her love is so strong, she even compared it to her religion and God. The poem Remember, by Christina Rosetti, who had an illness. The poem basically is Christina Rosetti telling her husband to remember her when she is dead. The poem is structured as a sonnet as well like How do I love thee; the language the poet uses to express the meaning of the poem is by repeating the work “Remember” the poet is telling her husband to remember her when she is dead. “Remember me when I am gone away” this suggests the poet wants her husband to remember her, however “Yet if you should forget me for a while and afterwards remember, do not grieve” this suggests she still wants her husband to live his life, even if it means he forgets her. “Better by far you should forget and smile than that you remember and be sad” this also suggests that she rather her husband forget about her and not be sad. Remember and How do I love thee, both have some similarities, they both use repetition. How do I love thee repeats “I love thee freely, I love thee purely, I love thee with passion, and Remember repeats “Remember” both these repetitions express the love for both poets husbands or partners. However Remember doesn’t share similarities with When we two parted. When we two parted which was written by lord Byron is about a break up and expressing love in a different way to Remember and How do I love thee showed. This poem also shows the typical marriages men and women had at that time “You tell me of our future that you plann’d” this suggests her husband would have decided their future, meaning he’s in charge. The tone of the poem changes, the first 8 lines is more of her telling her husband to remember her and that their relationship will end in her death, but in the last 6 lines she has a softer less demanding tone compared to the first 8 lines, she also realises her death could cause a lot of grief for her husband. The last poem is When we two parted, which was written by lord Byron. Shows the love lord Byron had for his partner, however the relationship breaks down due to betrayal. This poem is also a sonnet like the other two, meaning it’s also about love. The poem is basically about Lord Byron who had an affair with a married woman, only to find to she had other affairs. The poet uses repetition to help communicate the meaning of the poem; the word “silence” was repeated at the end and start of the poem, possibly suggesting because they were having an affair, they had to be careful and sneaky. The poem is similar to the other two, but only because it’s also about love, and When we two parted has more of a negative tone compared to the other two. In the first and second stanza he says “colder thy kiss” and “The dew of the morning” this suggests the coldness he’s feeling. The last stanza, says “In secret we met in silence I grieve that thy heart could forget” this suggests he is still grieving, but is starting to let go and forget. “Thy spirit deceive if I should meet thee after long years how should I greet thee? With silence and tears” this implies that if they are to meet again he doesn’t know what he would say or if he would grieve. This poem is very secretive, words that suggest this are “secret” “silence” this shows their relationship involved a lot of secrecy. In conclusion, all three poems share one same similarity; they are all sonnets, which talk about love. When we two parted has more of a sad tone compared to the other two and is about a break up. Remember, is about Christina Rossetti, who suffers from an illness which will eventually cause her to die, the first 8 lines on the poem seem sad however the last 6 lines tone turns softer compared to the first 8 lines. How do I love thee is E.B Browning expressing her love for her husband through out the poem, and how strong their love is that even when she dies she will continue to love. 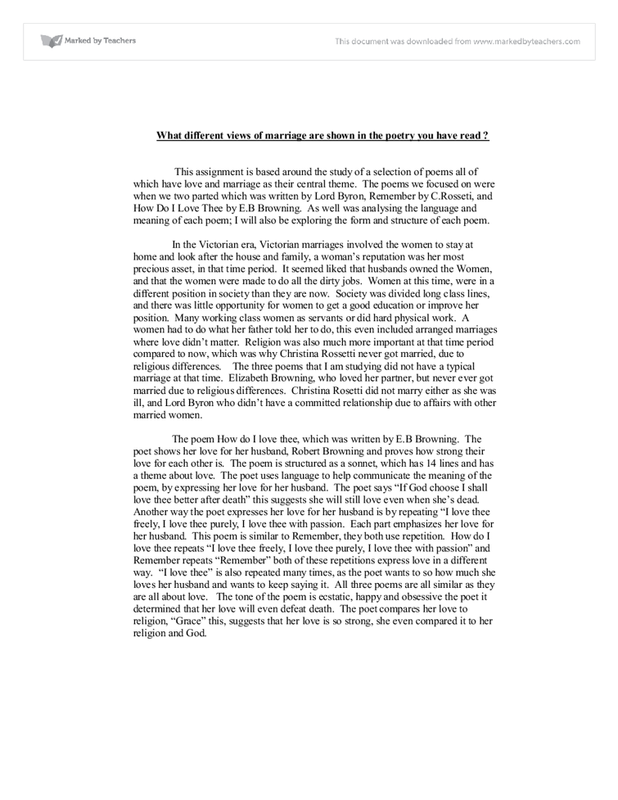 All three poems express love, but in different ways When we two parted has more of a sad tone, Remember, starts off sad telling her husband to remember when she is dead, however near the end she realises that remembering will only cause grief, and How shall I love thee expresses just how much E.B Browning loved her husband. Not My Business and 'District 6' compared. During the poem she talks about how much she loves him and nothing can get in the way. "How do I love you" is made more convincing because it includes a lot of persuasive techniques. "I love thee purely, as they turn from Praise". the last five words are about wanting to forget him which leads into the sestet which is dominated by her feelings and her efforts to forget him. You can observe this easily in the opening line, "There are hundred places where I fear To go, - so with his memory they brim!" complete", whilst Rossetti is the more in-control woman which is waiting for her love in splendour of royalty. The other apparently insignificant detail is that of the poems title, which of the two the latter seems to have a deeper meaning. In verse three he is accepting the sun as he is saying he is creating the perfect universe within his bed with his lover and a universe must have a sun. This is shown in the line "Shine here to us, and thou art everywhere; This bed thy centre is, these walls thy sphere." This one is easily noted as a system that continues down the same path daily, weekly, monthly, and annually. No changes are made and definitely none are pushed forth. A slow decay of the system is occurring and unless an upper manager wakes up, its demise is inevitable.